My 4 year old had a birthday party to go to yesterday ... a gymnastics party! 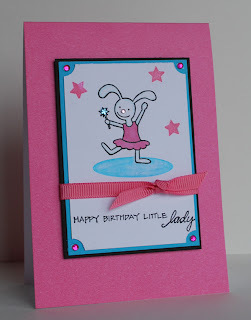 I immediately thought of this cute bunny princess and made a quick card for the little lady! We had a blast at the party - Parker got to jump off a trampoline into a big foam pit and ride a zip line across the gym! Of course, I was the mom that forgot my camera! Doh!